Los Angeles, CA (August 17, 2016) Despite the familiar belief that candidates must appeal to the "moderate middle" of the voting public in order to win elections, U.S. presidential candidates routinely take less-than moderate positions on a variety of issues. Are they catering to the extreme views of their respective core supporters? A new study out today finds that Republican presidential candidates are generally more responsive to the views of their base voters than Democratic candidates, but neither party's candidates are more than minimally responsive to the preferences of the swing voters whose views define the center of the political spectrum. The study was published as part of a special issue of The ANNALS of the American Academy of Political and Social Science (a journal from SAGE Publishing) titled "Elections in America." "If extremism is a problem in presidential politics, it seems to be at least as much of a problem for Democrats as for Republicans," writes the study author, Larry M. Bartels of Vanderbilt University. "My findings provide ample grounds for alarm for anyone who believes that presidential candidates should be responsive to the views of swing voters." 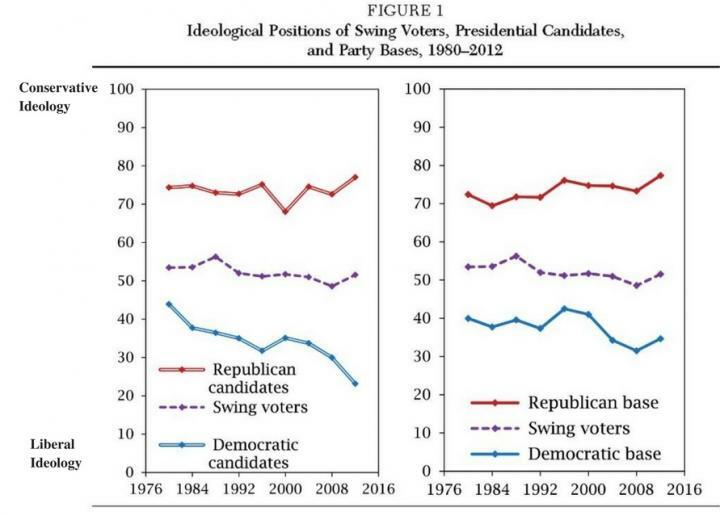 Bartels compared the positions of presidential candidates from 1980 to 2012 on a variety of political issues to the preferences of swing voters and of their own core supporters. He used data from American National Election Studies surveys, utilizing a "liberal-to-conservative" 100-point scale and adding viewpoints on government spending, government jobs, aid to African Americans, and defense spending. Bartels concluded that the candidates' unresponsiveness to swing voters is not merely a reflection of the influence of core party members. The parties' respective bases have indeed become more polarized in recent years, with the Republican base making the more substantial shift. However, candidates' positions are frequently even more "extreme" than those of their core supporters. "The idea that candidates' positions reflect strategic compromises between the preferences of core partisans and swing voters fares poorly here," Bartels wrote. "Perhaps they reflect the influence of much smaller, more extreme subsets of 'intense policy demanders' or big donors, activist groups, and grassroots conservative or liberal organizations distinct from the larger cadres of core partisans."